Testing circuits on your printer is a great way to verify what might be faulty (or not). The following is a set of guidelines for verifying the continuity of the circuits in the various components of your solidoodle. The stepper motor chips can be found on your mother board. The motherboard is located on the back of the machine. The stepper motor chips are in the center of the motherboard, with screws for adjusting the trimpot. For those who are less electronically inclined, a trimpot, or Trim Potentiometer is essentially a knob that allows you to adjust the current going to a given component. In this case, the potentiometer is controlled by a small screw. *The Stepper Chip is Highlighted in Red. There is a chip for each axis. Make sure your machine is powered up, and adjust the screws carefully. You shouldn’t ever need to turn the screw more than 1/16th of a turn. It is vital that the screwdriver only touch the screw, and not other parts of the board. If you carelessly touch the screw driver to the board you may incur a short that ruins your board. For the stepper chip, clockwise is more power, and counterclockwise is less. Chips which do not have enough power may act unpredictably. Chips with too much power will often overshoot their intended goals. This is where the probes must go to adjust the stepper chip. If you have the Rev E of the Motherboard, probe in the locations shown below instead. Notice the screw for the stepper chip below. An example of checking the voltage while adjusting the screw. In many cases you will be able to hold both probes in on hand, and the screw in the other. To test your Stepper chips, You should be using a lower calibration for your multimeter, set your multimeter to 2V (Volts). The following are the appropriate values that should be returned by your multimeter if everything is correctly set up. An example of a stepper chip reading. This article will show you how to test the heating element in your Hot End with a multimeter for diagnostic purposes. To test your Hot-end, set your multimeter to 200 Ω to test for resistance. Unplug the MOLEX connector from the extruder (It is attached to the green sheathed wires). Now probe the leads coming off of the back end of the connector. Alternatively, you can probe the pins that reside on the top of the MOLEX connector. This is demonstrated in the image below. For extra assurance you can test the resistor leads directly by removing the black insulator rings that cover your nozzle. Once you have removed the insulator ring, the resistor will be exposed. You can see the resistor which will be residing in a hole bored through the aluminum heating block. Probe each side of the resistor. Your Multimeter should return a value of 5.4 Ω when testing the resistor on your Hot-end. Sometimes errors occur with the thermistor. These most commonly manifest as a failure for the Solidoodle to heat the extruder and an accompanying "printer stopped due to errors" message. These issues are easy to fix, but it is essential that you are thorough with your testing, to track down the source of the problem. Often times, it is simply enough to unplug, an replug the blue molex connector. If you have re-established the connection, then the printer should begin reading temperatures once again. The overall rationale behind the error, is that that the printer is set up by firmware to shut down instantly if there is any loss of connectivity to the thermistor, or if there are unnatural/unrealistic temperatures recorded. For instance, if there is a unreasonably high temperature recorded you will receive a MAX TEMPS error. This is a safety feature, and should not be disabled, but does cause unwanted shut offs if there is a loose connection in the thermistor wiring. To test your Thermistor, set your multimeter to 200K Ω to test for resistance. Unplug the Blue connector from the extruder (It is attached to the clear sheathed wires). Now probe the leads coming from inside Blue connector. Your Multimeter should return a value of 80K-85K Ω when testing the Thermistor on your Hot-end. Once you have found the loose connection, it should be as easy as pushing a stray wire back into place. A very small minority of users have damaged thermistors. If this is the case, thermistor replacement is quite easy. 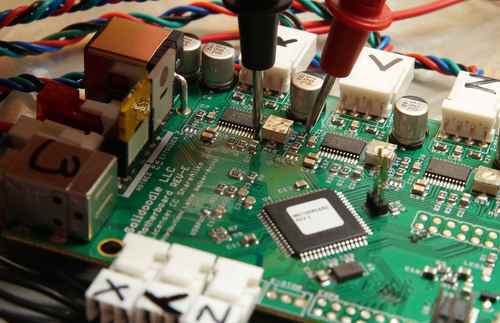 To test your Heated build platform, set your multimeter to 200 Ω to test for resistance. Unplug the small Red connector from your Solidoodle’s motherboard that is marked with the letters “PB,” (this stands for Print Bed). Observe this photo towards the bottom of the Motherboard. The red connector that you should be disconnecting is labeled 'PB,' it is located on the bottom right hand side. Now probe the leads coming off of the back end of the small Red connector. Solidoodle Generation 2 = 2.3 Ω when testing the Heated build platform. Solidoodle Generation 3 = 1.9 Ω when testing the Heated build platform.